LET OUR EXPERTS GET YOU THE PROFESSIONAL LOOK! Dye sublimation technology allows for amazing colors and greater detail than embroidery or silkscreen. A minimum $50 design fee will be applied if we need to design the shirt. The design fee will apply to all existing designs that need to be modified. We have several materials to choose from. Please feel free to discuss your options with one of our knowledgeable sales representatives. Do you oversee a race team? Do you have a crew of mechanics or engineers that you're looking to outfit in custom crew shirts? If so, we can help at SoCal Race Shop. We have a wealth of experience both designing and manufacturing custom race team shirts, crew shirts, and other apparel for race teams and businesses. You can rest assured that we have the experience, practical knowledge, necessary know-how, and manufacturing facilities needed to deliver. Working with our own manufacturing facility, we maintain complete control over every facet of our products, including design, manufacturing, distribution, and pricing. Because of this unique position within the industry, we are able to meet your every need at an extremely competitive price point. Whether you need 10 shirts or 50, custom designed from scratch or produced from an existing design template. We are happy to work with our customers to deliver solutions that are uniquely tailored to their needs. We invite you to learn more below. You will not be disappointed in our custom crew shirts and race team shirts, we can assure you! We specialize in karting equipment, race apparel, and safety equipment. 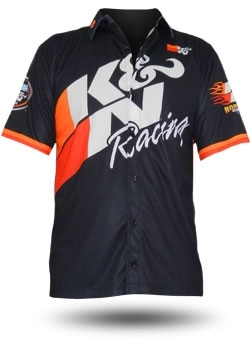 Our crew shirts and race team shirts are designed to the same high standards as every product that carries the K1 Race Gear logo. If you choose us to design, manufacture, or design and manufacture your custom crew and race team shirts, you can expect to receive your product on time, exactly as advertised. 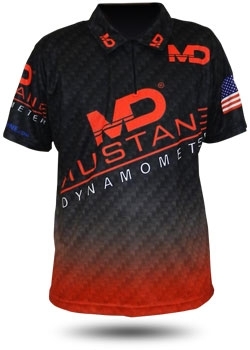 Our most noteworthy feature is the use of dye sublimation technology. With this technology, we are able to produce richer colors, greater contrast, and more precise detail than we would with silk screening or embroidery. Your custom crew shirts and race team shirts won't look like they came from the local silk screening shop down the street – they will look professional! Order Today – We're Here to Help! 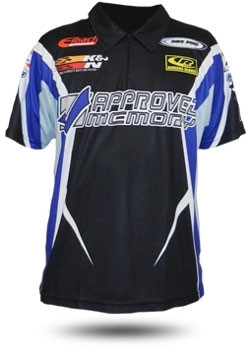 Unlike most of our products, the custom features and unique properties of our custom crew shirts and race team shirts means that we can only accept orders over the phone. We invite you to call us today if you have any questions or are interested in placing an order. We would be happy to work with you to deliver a product that meets your exact needs. So stop hesitating and make the call today! After all, you don't want to be the only team at the track with mismatched shirts. Stand out. Stand proud. Let us help. A minimum $50 design fee will be applied if we need to design the shirt. The design fee will apply to all existing designs that need to be modified. A 1-time set-up fee of $150 will be applied to all new designs and to orders of less than 10 shirts.